Please watch the video from 35:41 to 35:50 mark. No need to watch any other parts of the video. When you watch, look just left of center and you will see a woman walking towards the camera, focus directly on her during the segment. Now ask yourself a question. Why was she not in the so called gas chamber at Auschwitz? I shall leave that to you to decide and comment. According the ridiculous & impossible storyline, that old lady would have been gassed immediately. Recall that the official storyline says that all those unable to work: too old, too young, physically unable, etc, were gassed 'upon arrival'. Yet another nail in the 'holocau$t' coffin. The gas chamber was full. Or she escaped, like other credible eye-witnesses Just register here http://vhaonline.usc.edu/login, search for e.g. “gas chamber”, “mass execution survival”, … here http://vhaonline.usc.edu/search?search=0 and watch. Maybe "they ran out of gas"
"Maybe old people resist better,I don't know"
There are other pictorial problems for the scam. 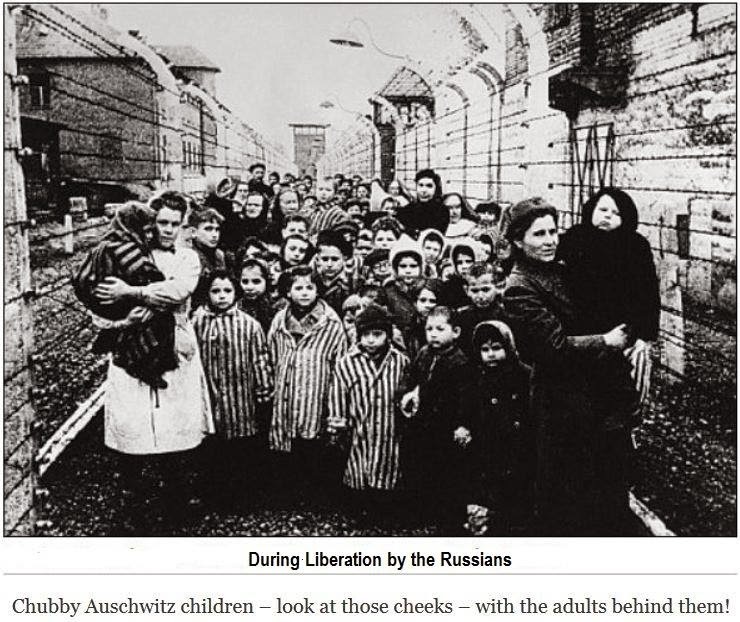 Healthy Jews at Auschwitz 'liberation' in spite of the claim that the Germans supposedly 'tried to kill every Jew they could get there hands on', complete with children that should have been gassed, IF the lies were fact. And did anyone mention the many Jews BORN at Auschwitz? 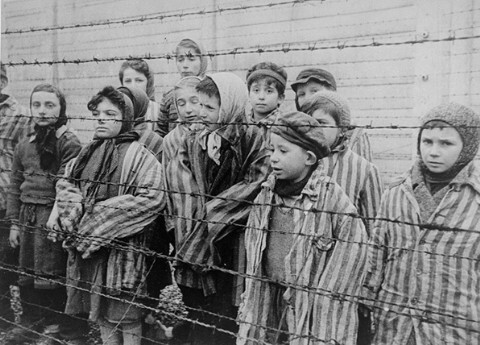 Why do so many people want 6M Jews to be dead? Revisionists don't. 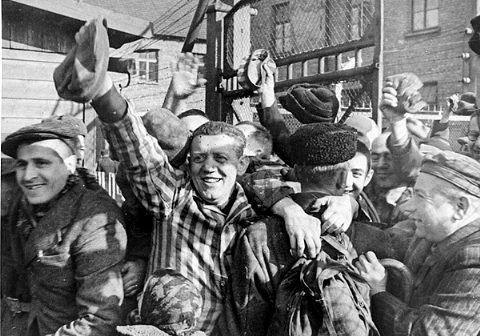 Jews should be elated to know that 6M of their brethren were not murdered. 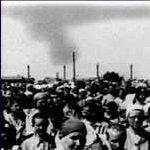 I feel this small clip makes all those photos of elderly, women and children walking to the gas chambers very suspect. In other places I post this, I get thumbs down. I submitted this to David Irving and he replied he could not see what I was talking about and said I wasted his time. I tried to reply but he seemingly blocked my email address. I stated the same instructions to you all to Irving. If anyone knows a good revisionist, this may be good ammo for their augment. I am not looking to make a name, just get this out there. The video I provided before has been taken down of the lady walking in the barracks. See this video and watch from 11:19 to 11:33. Longer than the last video. Is there anyway I can archive this video in case I want to use it again? What is your point of view about this film and does any of it make you consider your belief or doubt about the holocaust claims? His point is this .... as per the holohoax, Jews not fit for work were selected on arrival and sent to the gas chambers. The woman walking toward the camera is clearly not fit for work, so what is she doing there? She should have been gassed if the holohoax were true. To archive a video get, for example, YTD video downloader at https://www.ytddownloader.com/, and download the vid. Then, create a vimeo account and upload the vid. If the ovens were not operational, thrown into a burn pit. It was not like there was a shuttle to pick up workers, thus they had to walk to their duties Kilometers away. Could she have walked there and back much less work? I let you all decide. bonniwell2923 wrote: It was not like there was a shuttle to pick up workers, thus they had to walk to their duties Kilometers away. Could she have walked there and back much less work? I let you all decide. She didn't necessarily have to walk to work, or even do physical labor at all. She could have been a Scheissmeister ..... all she needed was a clock to wear around her neck and maybe a whistle to let people know "times up! ".